Stable Cottage is a pretty three bedroom holiday home that can accommodate up to six, and is situated in a beautiful countryside location. Nestled at the heart of the Highbullen Estate in North Devon, guests staying at the cottage benefit from the use of the many onsite leisure facilities, including both an indoor and outdoor swimming pool, six all-weather tennis court, an 18-hole golf course, plus much more. Stable Cottage has been beautifully decorated throughout and is lovely and spacious making it ideal for either a group of friends or a family. The main features of the large open plan living room are the beautiful wood beams, and the exposed brick wall, which give the cottage wonderful character. The comfy, quality soft furnishings make for a great place to relax in the evenings and watch the 42" Smart TV. The glass patio doors lighten up the room and allow you to look out onto the terrace, you can even open up the doors on a warm summers day and listen to the local wildlife. At the other end of the living room is the dining area. This is tastefully decorated to match the living room and the large table can seat up to 10 for big family meals. Stable cottage's kitchen is stylishly decorated, complete with a large range cooker. You will be sure to have everything you need as the cottage features a microwave, a washing machine, a tumble dryer, a dishwasher and a fridge/freezer. Pots, pans, cutlery and crockery are also in place for your use. All three bedrooms are of a very good size and are equipped with zip and link beds to give you a choice of a king-size double bed or two single beds. Bedroom 1 has a bath with an overhead shower and a separate hand-held shower attachment, as well as a basin and a toilet. Bedroom two and Bedroom three both have en-suites with a toilet, a basin and a bath with a hand-held shower attachment, as well as separate shower cubicles. The outside terrace has plenty of seating along with tables to enjoy some alfresco dining and the beautiful countryside views. You can also explore the surrounding grounds of Highbullen Hotel, Golf and Country Club. toilet, tub, shower, En-suite to Bedroom 2 with separate bath and shower. toilet, tub, shower, En-suite to Bedroom 3 with separate bath and shower. There are three bathrooms at Stable Cottage, two of these are en-suites, the other can be either an en-suite or family bathroom depending on whether additional guests are staying in either the mezzanine or on the sofa bed. The bathrooms are as follows: Bathroom 1: Located next door to Bedroom 1 and can be en-suite if needed. The bathroom has a large bath with shower overhead, a WC and a wash-basin. Bathroom 2: The en-suite to Bedroom 2 is fitted with a bath, a separate shower, a wash-basin and a WC. Bathroom 3: The en-suite to Bedroom 3 is fitted with a bath, a separate shower, a wash-basin and a WC. Stable Cottage is ideally located within the Highbullen Estate meaning it is within easy reach of the leisure facilities, including an indoor heated swimming pool, all-weather tennis courts and an 18-hole golf course. The hotel also has a number of places to eat, including restaurants and bars; in the summer request afternoon tea on the lawn where the views are wonderful. The cottage itself is equipped to a high standard with everything you would wish when self-catering in North Devon. All the bedrooms are large and spacious and the living areas bright and comfy. There is even a large terrace with views of the countryside. Plenty of space and everything needed for a comfortable holiday. Disappointing for the golfers in our group that golf course was closed for most of our stay due to wet weather. They were able to play elsewhere nearby. Stable Cottage is a great place from which to explore North Devon whether you're walking, riding, cycling or driving. It is set in incredibly beautiful and peaceful surroundings with wonderful facilities on site particularly if you have children. The cottage is really well kitted out and was very clean. The hotel staff were very friendly and gave us really good advice about things to do. We'd love to go back. We very much enjoyed our stay. All the staff were so welcoming and went out of their way to help. The cottage was clean and well prepared. The cream tea on arrival was an unexpected touch, delicious. We had three meals in the hotel & the food was excellent. The Golf Course was in good condition & the family enjoyed the large indoor pool. We found plenty to do on the estate. We stayed at the Stables and were very pleased with the accommodation. The bedrooms were large and each bedroom had it's own bathroom. The kitchen was well equipped and we cooked for ourselves every day. The mezzanine floor for the children (aged 8 and 6) was perfect. We were extremely lucky with the weather and spent a lot of time on the patio. The swimming pool was lovely and some days we swam twice a day - never over crowded and at times we were the only ones there. My 2 sons used the golf course which they said was a great course. We had a boat and because the weather was so good we were able to water ski etc launching the boat at Appledore. The staff at Highbullen were always friendly and very helpful. The only reason I have rated this holiday 4 stars and not 5 is purely location. Due to the excellent weather it was a good half hour to the coast. A great holiday was had by all. Stable Cottage is ideally located for exploring both the coast and countryside of North Devon with Exmoor and the glorious sandy beaches all within easy reach. 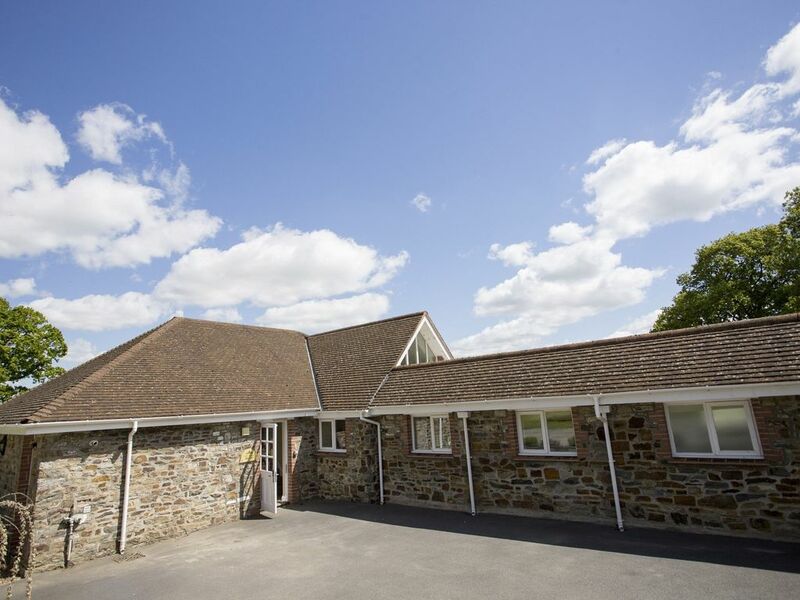 Stable Cottage is located on the Highbullen Hotel, Golf and Country Club Estate and guests can take advantage of the onsite leisure facilities, as well as enjoy meals in the restaurant. Facilities onsite include an excellent 18-hole golf course, all weather tennis courts, an indoor heated swimming pool, a billiards room and a gym. If staying during the warmer months enquire about enjoying afternoon tea within the grounds.